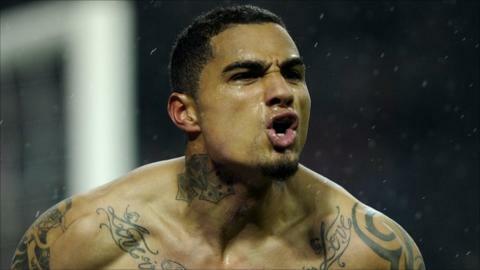 Ghana midfielder Kevin-Prince Boateng has insisted that he is committed to the Black Stars' cause. The Schalke midfielder's attitude to the national continues to be the subject of much speculation in Ghana and beyond. Ghanaians have accused him of playing hard to get since returning from international retirement in June. A lot of the anger towards Boateng has been channelled through social media platforms like Twitter and Facebook. But Boateng rejects criticism of his commitment to the national, blaming injuries for his absences. "Of course it's a bad situation because every time there is a national team game I have a problem," he told BBC Sport in Istanbul, Turkey, where the Black Stars are camping ahead of Tuesday's World Cup play-off second leg against Egypt in Cairo. "I can't come if I'm injured. I want to be 100 per cent; I want to give everything when I come to play for Ghana. "I'm always happy when I'm called to play for the Black Stars, that's why I'm here. "I'm part of the team and the coach, the (Ghana FA) president and the players know I'm always proud to be here. "Social networking sites are an easy way to insult people. People have sent me messages saying that they are praying for me to get injured. "Such messages are not nice because I love playing football; I love playing for my club, I love playing football for Ghana." Boateng knows that the only way to win over the fans is to let his football do the talking on the pitch. He said is determined to do just that if he gets the chance to play against Egypt. "I hope I can play my part because I'm feeling very good."